Ryan Matthews’ dog training career began in 2002, in the US Army, training elite Military Working Dogs (MWDs). A decorated veteran, Ryan performed bite protection, bomb threat sweeps, secret service missions and combat deployment to Iraq with Army K-9, Zito. He successfully worked with Special Forces, Army SWAT and Infantry units with his trained companion, Zito who ultimately saved lives over their period of service. Ryan’s passion for dogs and seeing them unleash their potential is the inspiration for his new dog training book titled “Train Your Good Dog to be Great.” To complement the publication, Ryan has also created an eLearning platform with more than 130 supportive dog training videos. In addition to training dogs, Ryan has recently taken on a new health project aimed at improving the lives of dogs. His vision is to free dogs of pain and reduce the likelihood of life-threatening illnesses through his new line of natural canine supplements. Having successfully trained over 3,000 dogs with a 99% success rate, Ryan is passionate about bridging the gap of communication between dogs and their owners. He feels when people can better understand their dogs, it enhances the lives and increases the bond of both people and dogs. 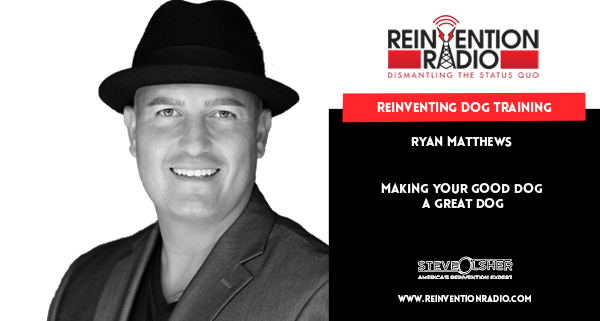 Tune in to hear Ryan share with Steve, Mary, and Richard how to make a good dog a great dog by resolving your dog’s behavior and obedience problems. 'From drug dealer to military drug dog handler. Ryan Matthews shares the journey. Reinventing Predictions for 2019 – In this episode, tune in to hear Victoria Bearden share with Steve, Mary, and Richard her predictions and insight for 2019.